To identify the best treatment for cognitive impairment, you must first know all of the evidence-based interventions. Thanks to ACRM and the BI-ISIG who developed the Cognitive Rehabilitation Manual: Translating Evidence-Based Recommendations into Practice, that knowledge is more accessible than ever before. Register by 9 March and save up to 45 percent off this ground-breaking, introductory training for Cognitive Rehabilitation. Registration includes two days of live instruction, CE credit, and a printed copy of the manual — a $150 value. 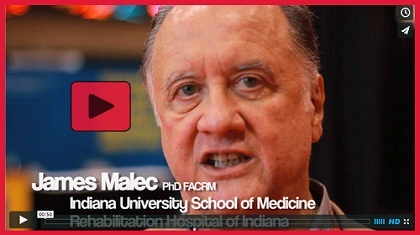 This training will precede the ACRM Mid-Year Meeting, 8–9 April at the IU Neuroscience Center in Indianapolis. The Annual Conference Call for Proposals will close on Monday, 23 February for preconference instructional courses and core conference symposia. Have you submitted yet? Scientific papers and posters are due 2 March. Why not extend a personal invitation to your favorite speakers and top researchers at your own institution to encourage their submissions? The Program Committee seeks your help in identifying and reaching out to the top researchers working in rehabilitation today. We are planning for another conference of record-breaking attendance. Don’t miss this opportunity to share your latest research with an interdisciplinary audience of your peers. Hosted by ACRM Institutional Member, Rehabilitation Hospital of Indiana, this year's Mid-Year Meeting will be held at the IU Neuroscience Center in Indianapolis, IN. Come see one of the nation's top research institutions and connect face-to-face with ISIG and task force members to advance your shared goals. This small, no frills meeting, is the perfect place to dive into your groups' priority projects to improve lives, advance the field and super-charge your own career. Visit the website to learn which groups are meeting (all BI-ISIG task forces, Stroke ISIG, SCI-ISIG and others) and book your travel arrangements today. The discounted ACRM hotel block is filling fast. A new task force of the ECNG, the Mentoring/Advising Task Force, launched a survey on Monday, 16 February, to all ACRM members. They are seeking input to help identify the current needs and potential opportunities for mentorship among members representative of all career stages through research, and educational and clinical collaboration. You do not need to be a member of the ECNG to participate. If you have not yet responded, please check your inbox and take a moment to provide your insights on this important topic. The NIDRR FY 2014 Organization Highlights Report is now available. The report provides a summary of NIDRR's activities and accomplishments in fiscal year 2014 — who they are, what they do, how they spent their funding, and what key accomplishments they achieved in fiscal year 2014. The objective of this study was to test whether subsensory vibratory noise applied to the sole of the foot using a novel piezoelectric vibratory insole can significantly improve sensation, enhance balance, and reduce gait variability in elderly people, as well as to determine the optimal level of vibratory noise and whether the therapeutic effect would endure and the user's sensory threshold would remain constant during the course of a day. Researchers evaluated the effects of transrectal ultrasound-guided trocar catheter transurethral botulinum toxin A (BTX-A) injection into the external urethral sphincter (EUS) for treating detrusor external sphincter dyssynergia (DESD) in men with spinal cord injury. The Institute of Medicine says that not only is chronic fatigue syndrome a "real" disease, it's one that deserves a more accurate name — "systemic exertion intolerance disease" (SEID) — and a new code in the International Classification of Diseases, 10th Edition (ICD-10). The report stresses the importance of direct contact with primary care providers, but adds that "many other healthcare providers often diagnose and/or care for patients with SEID" and should be an integral part of the communications efforts. That list of providers includes physical therapists. When my PT practice was just a couple weeks old, the few patients I was seeing each week were not enough to pay the bills. I had to act fast to fill my schedule, and I did so through a variety of marketing techniques. I'm in full support of those who want to add non-PT services like personal training, yoga and Pilates to their practice, but this was not something I wanted to do early on. So if I wasn't going to hire these professionals as employees/contractors, I should at least get them to send me patients, right? Looking for similar articles? Search our archives here. Use keyword: Practice. Early career members of the ACRM Brain Injury Interdisciplinary Special Interest Group (BI-ISIG) are invited to apply for a scholarship to attend the ACRM Mid-Year Meeting in Indianapolis, 9–11 April 2015. Four scholarships will be awarded to BI-ISIG members who are within five years of completion of training (terminal degree or postdoctoral fellowship, if applicable) and would like to attend the 2015 Mid-Year Meeting. Each scholarship will reimburse travel expenses up to $400. Past awardees may re-apply. Self-nominations are welcome. Need assistance? Contact Terri Compos, +1.760.436.5033. Layton John's desire to help traumatic brain injury patients and their families stems from when his wife's sister committed suicide in 2005. The suicide was years after the pediatrician had supposedly recovered from a serious head injury. John couldn’t help but wonder why and how it happened. It was questions like those that led to the creation of the Dr. Lisa Thompson Center at the Rehabilitation Hospital of Indiana. John has worked to raise funds to support the center and two of its unique counseling programs. Traumatic spinal cord injury is a severely disabling condition that can result in full or partial paralysis, as well as sensory and autonomic dysfunction. SCI has an estimated incidence of 12,000 new cases per year in the United States alone, caused primarily by automobile accidents, falls, violence and sports. Despite extensive research, an effective cure is yet to be defined. A combination of factors contributes to the difficulty in drawing an effective treatment to SCI. Consequently, numerous strategies for spinal cord regeneration have surfaced in the last few years. An accelerated, task-based rehabilitation program helped patients with pure motor strokes recover hand and arm function quicker, but it did not produce better long-term outcomes compared with usual care, researchers found. Legendary Pianist Mike Garson took his talents from the stage to the studio to compose songs for people suffering from Parkinson's and Alzheimer's disease. Garson and neurosurgeon Dr. Christopher Duma founded the "Music Heals" project. The idea is to write music for patients with Parkinson's, Alzheimer's, autism and even depression to see what effect it has on their condition. Experts say that 80 percent of Americans will suffer from back pain at some point in their lives. Back pain costs more than $7 billion a year in lost productivity. People will do just about anything to relieve it. Here's a solution that doesn't involve drugs or surgery. A state-of-the-art hospital program in Tampa Bay, Florida, is giving cancer patients a new lease on life. Chemotherapy and radiation treatments can rob a patient of their abilities and strength, but the STAR program at Sarasota Memorial Hospital helps them restore what cancer took away. "STAR" stands for Survivorship Training and Rehabilitation.